Over the past fifteen years unmanned aerial vehicles, commonly known as drones, have risen from an obscure technology to becoming a key component of Western military power, with US, British and Israeli forces launching thousands of drone strikes across Asia, the Middle East and Africa. Drones have become one of the most used weapons in conventional wars, but are also being used far from any battlefield in so-called targeted killings to ‘take out’ those deemed to be a threat to security. While officials describe drone strikes as ‘the most precise and effective application of firepower in the history of armed conflict’, human rights organisations and journalists have documented that hundreds of innocent civilians have been killed in such strikes. But armed drones are more than just a new weapon system, the latest in a long line of supposed technological solutions to international security problems. Drones are also at the forefront of the rehabilitation of war itself. Through using remote-controlled drones as well as precision weapons, we are told, war is no longer the hell it once was. Such a narrative is extremely naive and dangerous. Not only does it obscure the casualties and destruction caused by drone strikes, but it also means that whenever there is an international political crisis, the press and politicians demand we ‘send in the drones’ as there is no perceived cost in doing so. This concept of so-called ‘risk-free war’ means the use of drones and Special Forces for intervention is rapidly becoming the first, not the last, option for our politicians. Besides the direct consequences on the ground, this also enables political leaders to sidestep having to address the underlying political and social causes of conflicts which in turn lessens the chances of achieving long-term just and sustainable solutions. 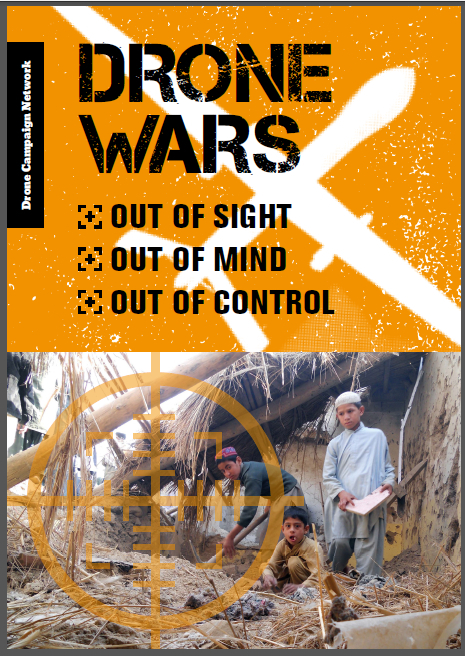 Our new briefing ‘Drone Wars: Out of sight, Out of mind, Out of control’ highlights some of the key issues surrounding the growing use of armed drones. In a readable and accessible way it examines the arguments around civilian casualties, how drones have enabled a rapid expansion of targeted killing and how drones are lowering the threshold for use of armed force. As one of only a handful of countries currently using armed drones, the UK has both the opportunity and the responsibility to take a lead internationally on controlling their use, setting high levels of transparency and accountability and also helping to put in place strong controls internationally to prevent the increasing proliferation of such systems. So far however, the UK is seriously failing in this, preferring to surround its use of drones with secrecy and lies. For example, rather than setting the bar high on accountability, the government is refusing to provide key documents even to the secretive Intelligence and Security Committee which is supposed to be investigating the drone killing of 21-year old Reyaad Khan in Syria last September. Committee Chair Andrew Tyrie told that Guardian that without the documents the committee would not be able to do its job. Another key secret is where Britain’s fleet of 10 armed drones are based and where they are actually operating? While the UK currently has a fleet of ten armed Reapers the MoD refuses to say how many are in Iraq and Syria, arguing that security concerns prevent disclosure. No such security concerns affect other UK aircraft however, with the MoD quite happy to detail how many non-drones are taking part in the bombing and where they are based. The secrecy applies only to the drones. The real reason for the secrecy is that the UK wants to be able to operate them covertly just as the US does. Who knows, perhaps as well as being in Iraq and Syria, some have been secretly operating over Libya? Or perhaps even alongside French and US drones in the Sahel? We are simply not allowed to know. Armed drones and the idea of ‘risk free warfare’ is a growing danger to global peace and security. At this crucial time, it is vital that all who want to see a more just and peaceful world ensure that we don’t allow armed drones to be out of sight, out of mind and out of control. A petition calling for more transparency to help you gather support and raise pressure.